Step 1: Cook Place sachet in a large pan of boiling water. Cover and simmer for 25 minutes for 'al dente' or 28 minutes for a softer texture. Step 2: Drain Take the pan off the heat. Use a fork to lift sachet out of the water by its handle. Holding the cold corner, cut open the top, and serve the rice onto a plate. Step 3: Enjoy Let the rice stand for 2 mins, fork through lightly. Serve hot. 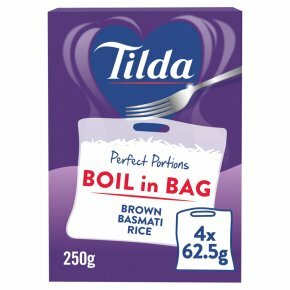 Place the sachet into a large pan of boiling.Return to the boil, partially cover with lid, simmer for 25 minutes.Lift sachet out carefully with a fork, drain well.Cut open with scissors, return to empty pan and leave to stand for 2 minutes.For through and serve.